“Resident Duty Hours: To Hand Over or Gloss Over?” is a new ACP ethics case study that is available online for CME credit. 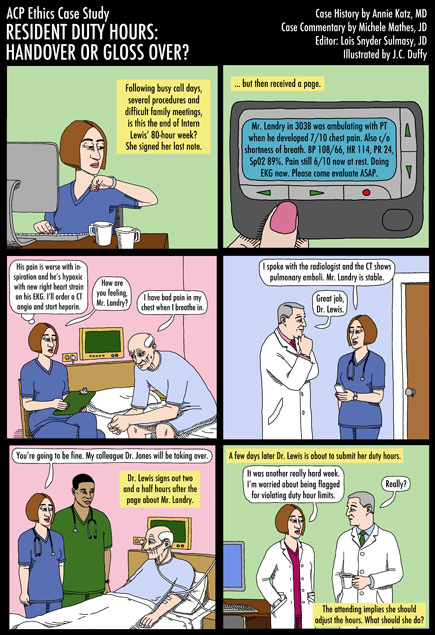 Using an illustrated story, this case study explores the ethical dilemma of a first-year medical resident who has hit her maximum 80-hour work week when one of her patients presents with a medical emergency. Does the resident “hand over” her patient to the next physician on duty, or stay to oversee the patient's care and not report the extra hours worked? This case study, and other case studies in the professionalism case study series, are available on the College's website. A Medscape login is required.